1993 Upper Deck SP unopened factory sealed box (DEREK JETER rookie card year)! This was the 1st year Upper Deck made these super premium "SP" product and has been an expensive luxury demand ever since its release! Other than DJ, there's also 1st Upper Deck rookie cards of Johnny Damon, Chipper Jones, Manny Ramirez, Carlos Delgado. All HOF worthy candidates and their rookie cards in this 1st PREMIUM/LIMITED SP product. And then there's the rookie card of Dmitry Young (card # 290/last card of the set) who is a major card collector himself and probably has 93 boxes of these hoarded away as INVESTMENT---these'93 SP unopened boxes are the BERKSHIRE HATHAWAY STOCKS in the card collecting market! Jeter is # 6 on the all time hits leaders with 3,465 hits. Only 2 players (Pete Rose & Hank Aaron) retired with more hits in the last 50 years! And just 5 players ever amassed more hits than Jeter in baseball history---that's about 150+ years since the beginning of professional baseball! Derek Jeter is THE MODERN DAY BASEBALL IMMORTAL, already mentioned amongst the "Mount Rushmore of Yankees" along side Babe Ruth, Lou Gehrig, Joe Dimaggio, and Mickey Mantle! "ALL I WANTED TO DO IS TO PLAY SHORTSTOP FOR THE NEW YORK YANKEES WHEN I WAS GROWING UP" ---quote from Derek Jeter. Endured and performed under the New York magnified scene throughout his celebrated career and a baseball icon for the past 20 years. His retirement farewell tour and final game speech moment will be replayed & remembered for generations to come and rank right up there along with Lou Gehrig & Mickey Mantle retirement moments! What will his 1993 Upper Deck SP rookie cards, sets, unopened packs, unopened boxes or unopened CASES be worth in future as his career is now cemented with ever growing legacy! Graded cards are great, but there will be more and more graded cards over time at ALL grade levels, imagine what a BGS 9.5 Jeter rookie card value will be when the 9.5 grade "population" becomes 200, 300+, or if there's suddenly a handful that grades higher at BGS 10? On the other hand, population/supply of unopened packs/boxes will decrease drastically over time and thus increase value! And Derek Jeter may just be the FIRST PLAYER EVER IN THE LONG 150+ YEARS OF PROFESSIONAL BASEBALL HISTORY TO BE ELECTED (UNANIMOUSLY) INTO HALL OF FAME. Same as 1986 Fleer basketball cards that 1993 SP cards were only distributed in unopened boxes, there are NO factory sets packaged by Upper Deck SP, and same as the 1986 Fleer basketball PREMIER issue being that 1993 was the first PREMIER issue of the popular "SP" edition, and similar print run as well! So Upper Deck made only a limited amount of "SP" boxes/cases back then and allocated only 1 case per major dealer based on "pre-ordering"---and not many dealers ordered them due to the high price and low demand popularity of baseball when all the collecting attention were on basketball cards at the time with Shaquille O'Neal rookies and the aftermath of the global storming 1992 Olympics dream team! Subsequently causing the 1994 baseball strike! Therefore, all 1993 SP baseball products whether it be single cards, sets, unopened packs, unopened boxes are "SCARCE" compared to all other sportscards printed at the time! November, 5 time WS champion, Yankees captain (DEREK JETER). 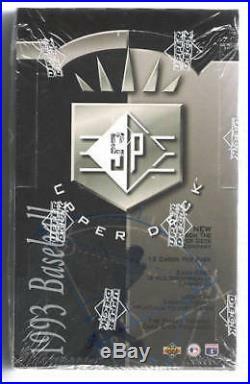 The item "1993 Upper Deck SP BOX DEREK JETER # 6 ALL TIME HITS / FIRST UNANIMOUS HOF" is in sale since Tuesday, July 14, 2015. This item is in the category "Sports Mem, Cards & Fan Shop\Sports Trading Cards\Baseball Cards". The seller is "pkks56" and is located in CA. This item can be shipped to United States.